"Chicago Tonight” has learned that Gov. Bruce Rauner and top Republican leaders are planning to introduce legislation aimed at an emergency financial takeover of the city of Chicago and Chicago Public Schools. This comes in light of an imminent $500 million shortfall within the Chicago Public Schools system. The Republican leaders are set to announce the legislation tomorrow, but Paris Schutz has the exclusive information tonight. Sources tell “Chicago Tonight” that the governor and his top two legislative leaders – Senate minority leader Christine Radogno and House minority leader Jim Durkin will file a package of legislation Wednesday that would allow for an emergency financial oversight board appointed by the state to take over the financially strapped school district. Other legislation would allow for emergency financial oversight of the credit-beleaguered city of Chicago. Legislation would also allow for CPS and the city of Chicago to declare bankruptcy – something by law both cannot currently do. We’re also told that the legislation would call for an elected Chicago Public Schools board once the financial situation is remediated. This, in light of the fact that CPS has set now as a deadline to receive $500 million in relief from the state or else lay off thousands of employees, including teachers. So far, no pink slips have gone out. I asked the governor today if that left bankruptcy as the only other option to save the entire system from failing. 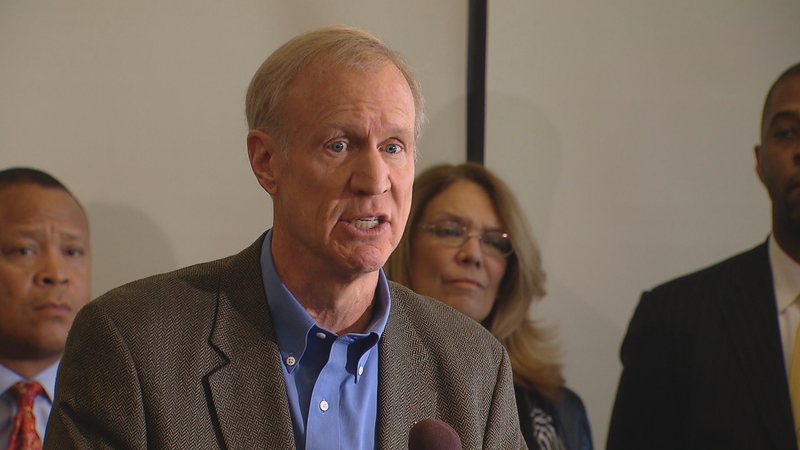 The governor hinted at big new efforts at relief for CPS, but did not get into specifics. The governor went on to say he couldn’t guarantee CPS layoffs wouldn’t happen. Neither the governor’s office or Radogno and Durkin are confirming the details of this plan. The move is not without precedent. Currently, a financial oversight panel is in charge of finances for the school districts in East St. Louis and North Chicago. The governor is defending a school funding system that is separate but unequal. Our children are facing systematic discrimination. CPS represents 20 percent of state enrollment but gets just 15 percent of state funding, even though 86 percent of our children live in poverty. “The missing 5 percent represents nearly $500 million, the exact amount of our budget gap. Our children's futures are just as important as those in the suburbs and downstate. But the state does not value them equally. The Chicago Teachers Union also lambasted the idea of bankruptcy or a state takeover, saying that CPS should have never relied on $500 million in relief from the state. They argue that the revenue should come from the city, and from renegotiating financial swap deals with banks that cost the district hundreds of millions of dollars. The package of legislation being floated would have to pass the Democratic-controlled General Assembly. Lawmakers are currently not scheduled to return to Springfield until next Wednesday. Tensions are rising between Gov. Bruce Rauner and one of Illinois' largest unions. We discuss what that could mean for the state with Anders Lindall, public affairs director for AFSCME Council 31; and John Tillman, CEO of the Illinois Policy Institute. State's Attorney Anita Alvarez faces critics and opponents in a contentious forum to answer the question of whether a special prosecutor should handle police shootings. Actions Wednesday by powerful aldermen Ed Burke and Carrie Austin signal City Council might not yet be ready for reform. Paris Schutz has the latest on that and how aldermen have watered-down the mayor’s borrowing plan – for now.